Saline, sodic and alkali soils present challenges for farmers, ranchers and landowners. 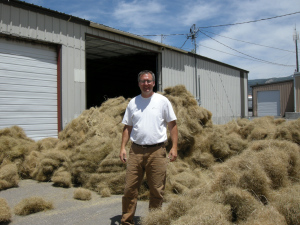 While these soil conditions will never be ideal or produce forage and biomass equal to more hospitable soils, there are solutions that will provide some satisfactory results. We offer a variety of seeds adapted to salty/alkaline conditions. The pH scale at right is the scale we are accustomed to. It is useful for visualizing pH on a linear scale from acidic (left) to basic (right). It helps us understand pH using common household items and points of reference we know from day-to-day living. From a soils standpoint, we can visualize where our soils are on the scale at a glance. The scale has shortcomings, though, and is misleading if not taken in the context of how pH really works. False encouragement can result if the numbers are not correctly understood and taken in context. The pH scale we normally see is an oversimplified representation of the way pH is actually measured. 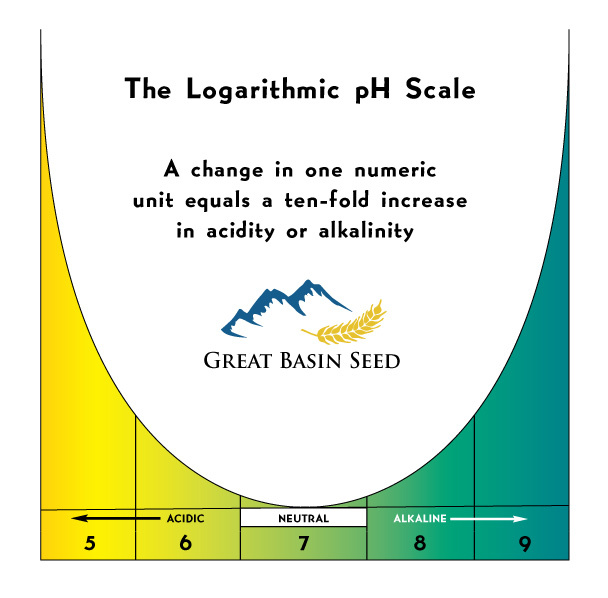 pH is logarithmic, meaning a change in one numeric value equals a ten-fold change in acidity or alkalinity. In other words, a soil with an 8 pH is ten times more alkaline that a soil with a 7 pH. This has dramatic implications for plant selection, and demonstrates why a plant that tolerates a 7.2 pH wont even begin to establish in a 7.5 pH. Note in our chart that we have not extended the logarithm past 5 acidic and 9 alkaline. Very few organics will survive in those conditions. We created this chart so you could visualize the dramatic increase in soil toxicity as pH moves further from neutral. Anytime a customer considers planting in saline and alkaline soils we strongly encourage a soil sample. It’s the first step in determining which species are suited to our site. A soil lab can analyze the makeup of your soil and provide a chemical/mineral “picture” of your soil. The analysis will also include information critical to the selection of appropriate plant species, soil preparation and conditioning methods and fertilizer/chemical recommendations. Once you have that information, you can select species that will survive within the pH and other parameters of your site. As you can see from the chart above, an analysis that gives you test results to the .10 is crucial. The folks at Stukenholtz Laboratory have great customer service, accurate tests and speedy results. They offer fertilizer recommendations with the analysis. The cost of a soil sample (about $20-$50.00, depending upon the kind of test) can save hundreds if not thousands of dollars in seed, fertilizer, diesel fuel and development costs. The soil sample gives you a baseline to work from, and narrows your choices down to what is known to work. Visit their website for instructions on how to pull and submit a sample. Once you have the results give us a call us…we will walk you through the process of choosing seed based on the test results. Soils high in salt and alkali (or basic soils) present challenging growing conditions. Basic soil conditions range from mildly alkaline, requiring little more that a variety selected for tolerance, to highly alkaline, nearing the point where very little will even survive in the conditions. Valley bottoms, “sump” areas, margins of marshy and/or damp areas and desert valleys and lowlands commonly present with these challenging soil situations. While these areas are challenging, there are solutions that will return an investment and turn a useless plot into a stand that will produce something of value. To purchase our Saline & Alkali Soil Pasture Mix visit the product page here. AC Saltlander Green Wheatgrass Very High 12"
Alkali Sacaton Very High 10"
Tall Wheatgrass Very High 8"
Annual Rye Grain Moderate 11"
Fixation Balansa Clover High 16"
Frosty Berseem Clover High 16"
Alfalfa Variable by variety 16"
Hercules Tall Wheatgrass High 16"